The first-generation PlayStation Portable is the newest console to become viable for emulation, thanks to JPCSP, where the "J" stands for "Jumping jodhpurs, since when did Java-based emulation get to be so quick?" Because this is a Java-based emulator, you'll need the Java Runtime Environment to go with it: Download jre-7-windows-i586.exe from the bottom of the list on this page of Oracle's site, and install it. Quick though it may be, PSP emulation is a bit of a crapshoot. Users of AMD cards need not apply, as the rendering hacks will cause them to crash and burn in many games, and even Nvidia users will find that JPCSP's main downloads page is so rarely updated that grabbing one of the nightly builds is essential. 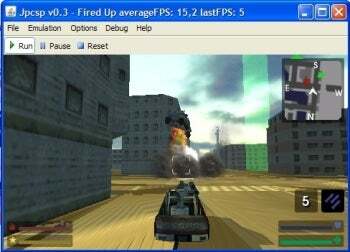 There are about 10 different renderer options, each with its own compatibility list, so you'll have to refer to these emulator forums to find the right settings for your game. Also, the 64-bit build won't play any FMV or music in most games, so get the 32-bit version for now. Unzip, and run the start-windows-x86.bat file; then go to File, Load UMD, and click the Run button at the top of the interface after the 20 or so seconds during which it appears to have crashed but is actually just loading your game without offering any visible indication of what it's up to. Be further warned: JPCSP tends to crash spontaneously or simply not to respond at all when resizing the program window. It may be a tremendous technological achievement that will only get better, and I still managed to play through all of Valkyria Chronicles 2 using the emulator as it is now, but you might want to wait for the dev team to work out some of the remaining kinks before you dive in.